A Section of J. Sage and Sons New and Reliable Rail Road Map comprising all the Rail Roads in operation in the Middle and Western States with their stations and distances. 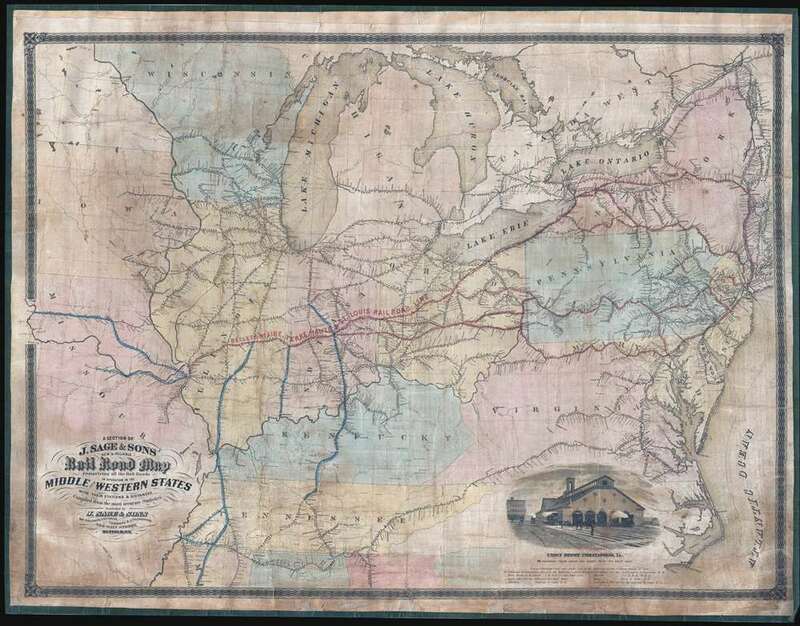 A rare 1858 wall format railroad map issued by J. Sage and Sons. The map's coverage extends from the Mid-Atlantic seaboard west to Missouri and Iowa, inclusive of all of the Great Lakes. It extends south as far as Tennessee and the Outer Banks. The map is highly detailed with regard to rail lines, including many stopping points throughout. Otherwise, the cartographers took a minimalist approach and area underserved by the railroad networks are generally left blank. Red overprinting emphasizes the Bellefontaine, Terre Haute, and St. Louis Railroad, an extensive network with coverage form New York City to St. Louis. In the lower left, there is an inset for the Indianapolis Central Terminal. In 1858 J. Sage and Sons issued a large wall map of the eastern half of the United States illustrating the rapidly expanding Railroad network. Sage planned to print the map in small editions that could be readily updated to keep both the price low and the content accurate. Despite his ambitions, we are aware of only two editions, 1858 and another in 1866 issued by Asher and Adams. Later in 1858, Sage used his plate for the wall map to issue smaller format wall maps under the 'New and Reliable' series title. The first such map, being the present example, detailed the Middle and Western states. In 1859, a second 'New and Reliable' was issued covering the Eastern States. The map is rare and we have identified no other verifiable examples. John Sage (1805 - April, 1894) was an American lithographer and music instrument seller based in Buffalo, New York, active during the middle part of the 19th century. He was born in Northampton Massachusetts, but relocated to Buffalo, NY, in 1826. Sage initially specialized in retail sales of musical instruments and merchandise, as well as printing stationary and sheet music. He acquired the lithography business of John Compton in 1856 and began publishing maps by 1858. According to some, he became one of the leading producers of township and railroad maps in the late 19th century, but we have only been able to identify 3 maps issued under his imprint. The Sage firm was based at 209 Main Street, Buffalo, New York. Sage ran his business with his sons, Henry H. Sage and John B. Sage (1832 - 19?? ), and a partner Loudon U. Dodge. Another son, William S. Sage (1834 - 1917), also joined the family business after extended travels in Europe. Dodge retired in 1867 and his shares were acquired by a William G. Boardman, and the company was renamed Sage, Sons, and Company Lithography, Printing and Manufacturing. John Sage himself retired in 1888. In addition to his success as a businessman and a printer, Sage was also an avid hunter and outdoorsman.